The nearest walk from Schoolfield literally starts from the front steps. It's fairly easy walk, taking me about 50 minutes to complete. Late in the afternoon, when the golden hudson valley light casts its long shadows, is my favorite time of the day to go. It takes you through a residential area, a riverfront hamlet, along the train tracks, and back up the west end of Main Street. Start by turning left and walking down Woods Road. Bear right at the fork where East Camp Road branches off. 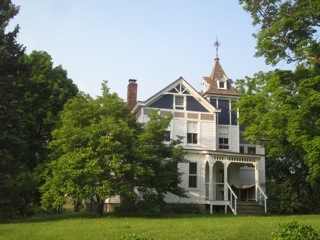 Though Woods Road is know for its grand old estates, the north end where Schoolfield stands is in dominated by variations on the typical post-war suburban ranch style home, interspersed with the occasional Victorian era farmhouse. On the river side of the road, homes and barns take advantage of the river and mountain views. 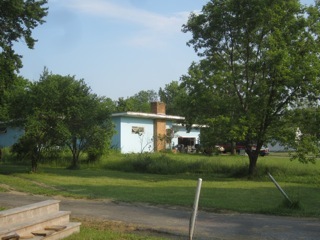 Amongst the ranches, stands one flat-roofed 60's era house, looking a little down at its heels, but a little unusual for the area design-wise. At the local VFW (known for their famous Sunday breakfasts), you will turn right off of Woods Road, following the sign to Cheviot. Although the building appears very utilitarian at first glance, a closer look can give some clues as to it's former life as a Methodist Church. 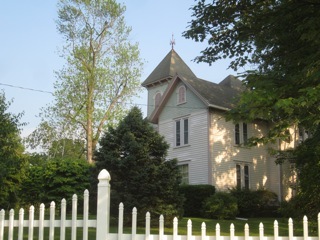 VFW in its past as a Methodist Church. 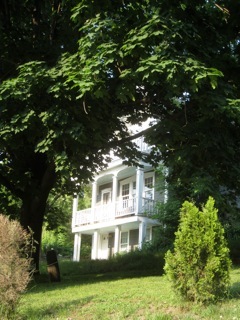 Photo courtesy of the Germantown History DepartmentYou soon pass another building given a new lease on life. 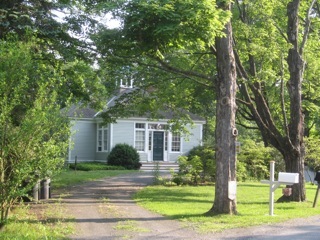 The old Cheviot schoolhouse, which has been pristinely renovated as a private residence. 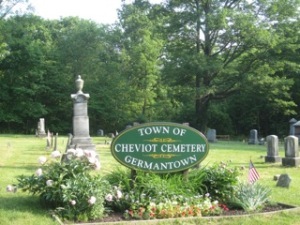 Next to the former school is the Cheviot Cemetery. It is worth a look around, many graves dating back to the 19th century, and bearing names commonly found in the town to this day. You turn right again by the historic marker for the settlement of East Camp, beginning you descent towards the hamlet of Cheviot. Note the sign is slightly misleading. 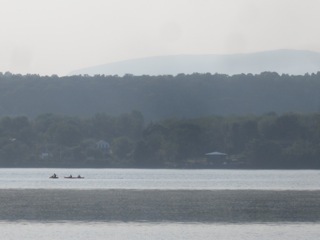 East Camp was how the four original Palatine settlements on the east bank of the Hudson were referred to collectively, it was not an individual settlement. The road down to Cheviot Landing is lined with charming homes, many recently restored, most of which boast great views from their front porches or back decks. Crossing the the railroad tracks, you go into the small town park with its boat launch and picnic facilities. 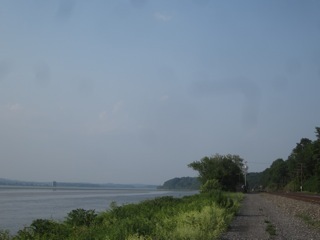 To see a view of Cheviot Landing in older days click here The walk continues north on the service road besides the railroad tracks. 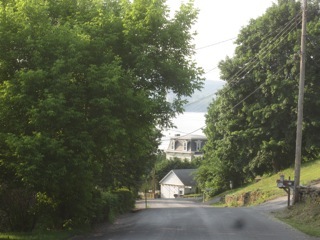 From here you can get great views of the Hudson and the activity going on on the water. Be sure to note the Town Hall (no longer in operation, or so i'm told). 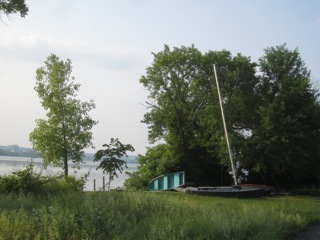 Along the way, they are several spots that allow you to go right to the waters edge, relax and enjoy the view. Soon you will approach a large brick building - the sole survivor of several large fruit cold storage facilities, from the days when the farms of Germantown had innumerable apple pear and peach orchards, and freight trains stopped here to carry the produce to points south. 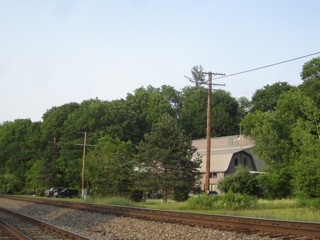 The remnants of other commercial and railroad structures , some converted to residences, are also to be found here. Across the way are several boats anchored offshore and docked on land. From here you will wind your way up Young America Road( also known as Lower Main Street). Along the way, you will pass some pretty gardens and handsome older homes. 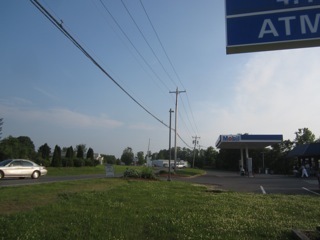 The handsome homes come to an end when the road aprroaches Route G, with its banks conveniences stores and gas stations. Turn right here. 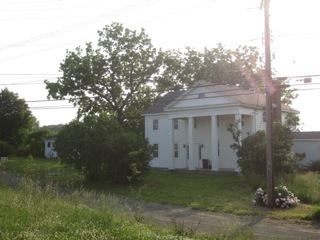 Take the right where Woods Road branches off Route G at this recently restored Greek Revival farmhouse. A quick walk around the bend, And you are back at Schoolfield! Please note, I walk at a fairly brisk clip, so if you go at a slower pace, it could about an hour.